Here at Petland, we are proud to work with Health Extensions, a family owned and operated dog food and supplement company located in New York. 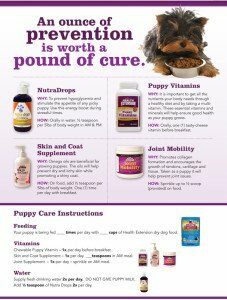 We feed and recommend all of their products in our store and every new puppy that goes home goes with each of their supplements and the appropriate puppy food. 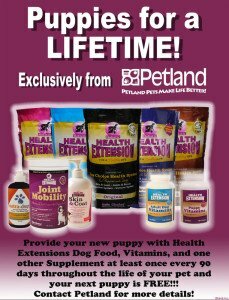 Petland believes in the power of Health Extensions dog food and Health Extensions supplements so much, that as long as you keep your new puppy in Petland’s “Puppies for a Lifetime” program, by continuing to feed the food and supplements, we will make sure you will ALWAYS have a Petland puppy! 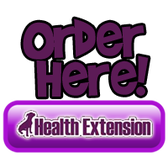 Health Extensions dog food and Health Extensions vitamins must be fed to this puppy for its entire life along with one other supplement of your choosing. This includes Health Extensions Joint Mobility, Nutri-drops, or Healthy Skin and Coat. You must make these purchases from the Petland from where you purchased your puppy once every 90 days. These items can be purchased at the store or shipped to your residence. Store credit given will be equal to the original purchase price and may only be used to purchase another puppy. *In the event that Health Extensions does not meet the dietary needs of your puppy, Petland will help find you a dog food that works and as long as the food is purchased from the Petland where you purchased your puppy, your puppy will be covered under this Lifetime Puppy Program. Health Extensions supplements must still be fed. Enrollment in this program is non-transferable between Petlands or Petland Corporate.